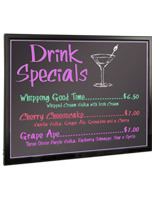 This Premium Sign Supply For Wholesale Comes With Everything Needed To Create Signage Quickly! This Sign Supply Is In Stock and Ready to Ship From Our Stocked Inventories! 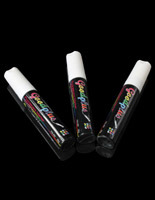 Write-on board with wet-erase markers allows you to change your message as needed! 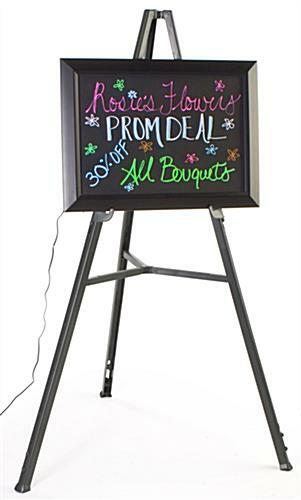 Floor-standing easel brings your 25" x 18-1/4" sign up to eye-level! Illuminated sign board offers thirteen different lighting effect settings! Bright fluorescent colors attract attention on black dry erase writing surface! 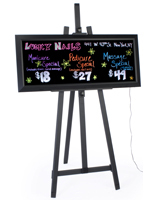 This signage panel, sign supply in black comes with a 25" x 18-1/4" black signage, a longstanding, yet easy to carry easel, and eight (8) fluorescent marker pens. The pens provided will brighten any text to make your signage extra appealing. The fluorescent panel can be displayed in a horizontal or vertical fashion on the included easel. After this sturdy sign supply that lights up is plugged in, the red, blue, and green edge LED lights alongside one side of the frame provide thirteen special fluorescent lighting patterns! This adaptability guarantees buyers produce their own unique fluorescent exhibit! This sign supply with illumination settings is a great deal as each separate part of this signage package can be utilized individually as well. Put this marker pen signage anyplace in you feel is best for your establishment! The decorative sign supply for business that highlights written messages is shipped with tools for wall-affixing or ceiling suspension. 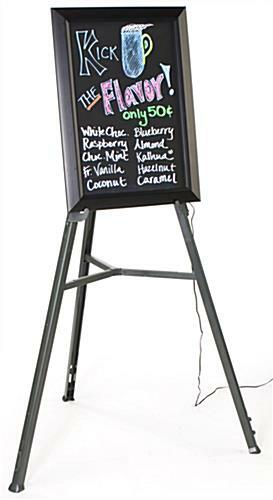 The easel is moveable and can even be utilized on a tabletop for smaller signage. 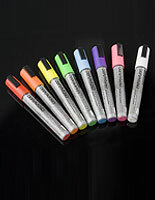 The wet-erase marker pens can be utilized on any impermeable surface area, from glass to whiteboards. The sign supply that flashes LED lights is sold with a non-abrasive cleaning fabric, as well. 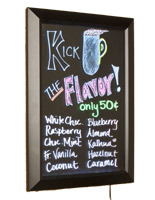 This sign supply lets you create instantaneous signage! Just draw your design or write your text with this simple illuminating exhibit. The sign supply, also recognized as a fluorescent signage panel, is excellent to utilize in eateries as a menu panel or anyplace sales owners want to promote right when customers walk in. Highlight your exhibit with LED lighting. The customizable sign supply that displays on counters or on walls is a black panel with a see-through overlay on which to write your tailor made neon communication. 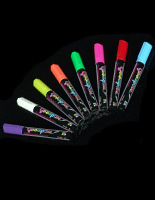 Choose a color from the liquid marker set that will mesh well with the setting your sign is placed in. 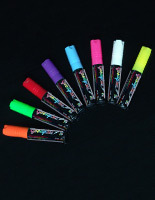 The sign supply is shipped with eight (8) 3/16" bullet tip marker pens to make your individual communications. This signage panel is certain to get notice from your clients or customers, no matter if you're using it as a store ad or a menu display! 35.0" x 62.0" x 22.0"